Here are two minifigures in London (well, actually they're in the Big London A-Z from 1993, which doesn't suit either of their timescales very well). I imagine that working out where Sherlock Holmes is shouldn't be too much of a problem. But Builder 2012 might pose a bit more of a puzzle. I must admit that I am rather impressed that Mr. Holmes' magnifying glass really works. 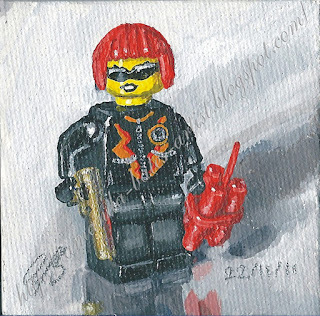 Lego Minifigures 28: "Sherlock Holmes"
Acrylic on canvas, 7 x 7 cm Lego Minifigures 29: "Builder 2012"
This is another tiny November rose, but this one was indoors, in a pot. And the leaves look healthier. The background is an approximation of a hardwood box that my uncle made me to put my very first oil paints in, which just happened to be there. 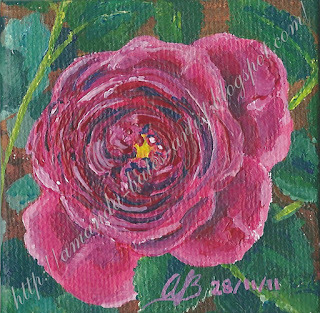 This painting has a restricted palette; I used a total of four tubes of paint: Process Magenta, Pthalo Blue, Lemon Yellow and Titanium White. Let's suppose that you buy one of my 7 x 7 cm canvases. What are you going to do with it? You could put it away in a drawer and take it out to peer lovingly at it every now and then, but I'm not sure that that's quite the idea. I rather suspect that you might like to display it in some way. 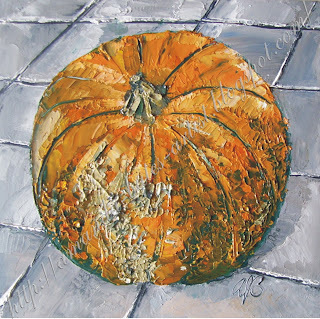 Now, as an acrylic on canvas, the usual approach is to treat it the same as an oil on canvas. It doesn't need to be put behind glass; all it needs by way of protection is a coat of varnish, and it should already be varnished (I've still got some to varnish, but they should all be done in time for the school fair next Friday; you can varnish acrylics almost as soon as they are painted, because they dry quickly). The canvas doesn't really need a frame - as noted earlier, I've painted the edges on the assumption that it won't be framed. 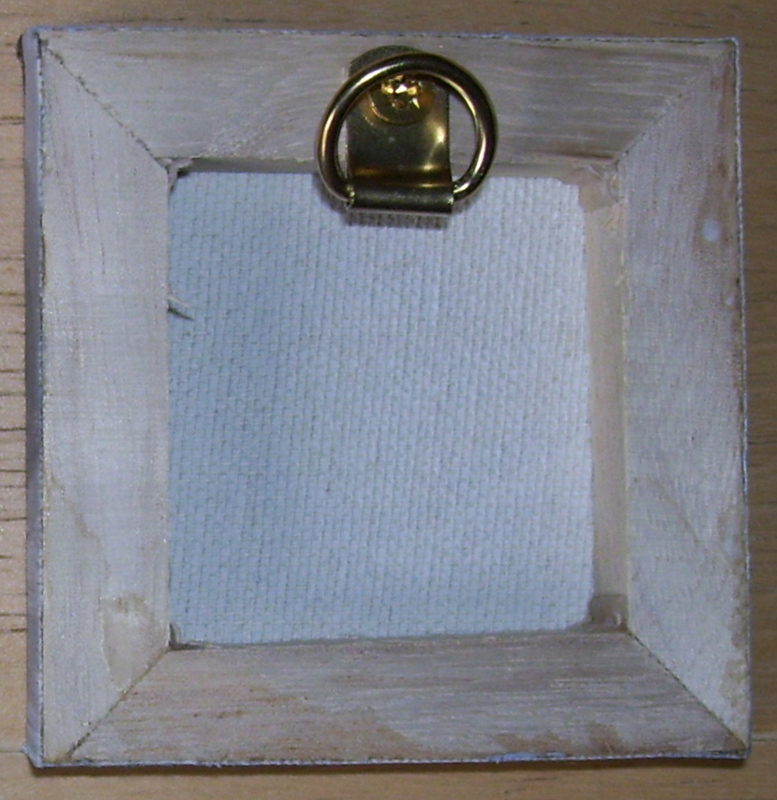 But actually displaying such a small canvas presents its own problems. Do you put it on a wall? And how? I'm not selling them equipped for hanging, although I have got a suggestion as to how you might hang them (and I can provide the hardware*). You might prefer to display them resting on a small stand - one of my friends mentioned plate stands. 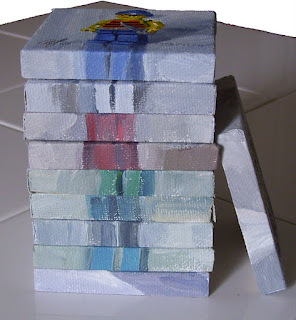 Miniature display easels are another option. The larger brass D ring on the right is one of the type I already had several of. But I thought that a smaller ring might work better, so I have invested in a few smaller, triangular rings. * Of course, if you'd rather buy your own, small quantities of limited types can be bought from all the usual DIY multiples. 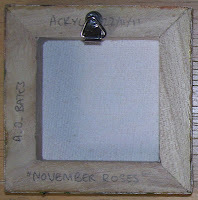 Or you can visit an online dealer like UK Picture Framing Supplies, who have a much wider choice. The folks at Ordnance Survey, they say Yes! 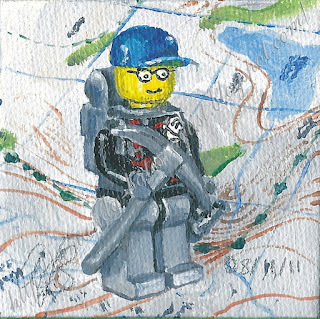 Technically, my paintings of Lego figures standing on maps are derivative of the mapping data. This means that they might infringe the copyright on that mapping data. In the UK, the Crown owns the mapping data - this is generally collected and administered by the Ordnance Survey, who also administer the copyright on the data. One of my friends pointed out my potential copyright infringement, and suggested that I contact the Ordnance Survey with examples of my work. I did so, and have received permission from them to use the mapping data "in this format" without incurring Royalty Fees. Expect to see a one or two more Lego figures on maps next week! 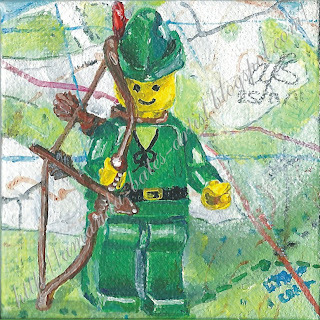 Lego Minifigures 27: "Robin Hood"
I was a bit pushed for time while painting this minifigure (I think Lego call him a forestman, but we all know who he is really, don't we? ), and while I started painting him in daylight, I had to finish under artificial light. We've got halogen lamps in the dining room, where I was working; goodness knows how the colour balance in those compares to daylight. But regardless of what it does to the colours, the shadows and reflections all change, too, when you switch an overhead light on. Fortunately, I was at the point of adding detail to the map and the printed bits on the minifigure when the light had to be turned on, which wasn't too bad. I've given Mr. Hood a proper longbow - filched from the elf - because the standard bows are, quite frankly, rather pathetic. A longbow, as I understand it, was typically as tall as its user. It shouldn't be difficult to guess where he is on the map, although - according to my current reading material (J. C. Holt's classic investigation of the legend, "Robin Hood") - he's probably in the wrong place. Lego Minifigures 26: "Yellow-Green Rock Monster"
"Aha! A crystal. Must tidy that up!" More from the planet of newspaper rocks. Lego Minifigures 25: "Power Miner"
The power miner is seeking crystals on the planet of newspaper rocks. 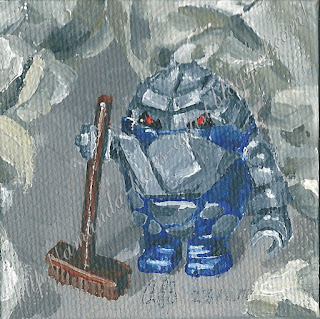 The only problem is, those pesky rock monsters keep on tidying them away... I think that's how it goes, anyhow. 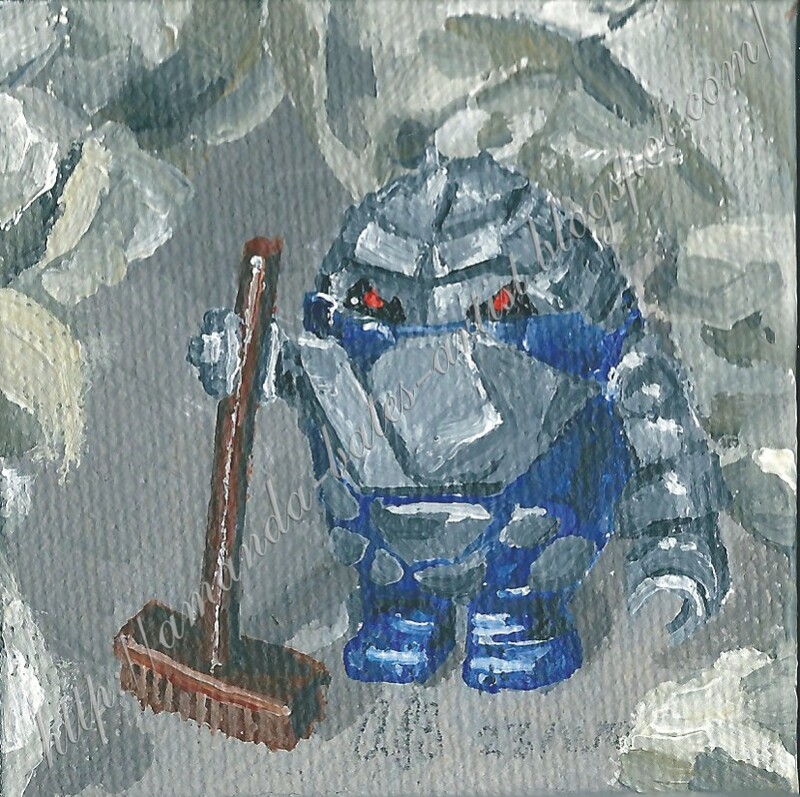 Lego Minifigures 24: "Domestic Rock Monster"
My daughter placed a broom in the hand of this blue rock monster and it just seemed so right. I improvised a set - the planet of newspaper rocks (although, as you can see, I didn't feel the need to even suggest the newsprint itself) - and gave the monster a temporary home to sweep. Lego Minifigures 23: "Hip Hop"
My son calls this figure his "DJ"; Lego call it a "Rapper"; I'm calling the painting "Hip Hop". 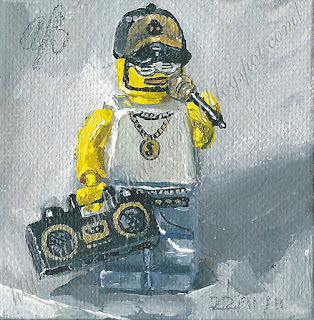 He's clearly old-skool, what with his goldie lookin' chain and cassette ghetto blaster. I'm not so sure about the shutter shades - they might be 80s vintage, but I got the impression that they were a new wave thing back then. Now, of course, I am reliably informed that Kanye West has been spotted wearing them. Hence the hip hop credentials. As for the amount of gold in this figure's painted-on mouth - well, it makes me shudder and recall Pam Ayres' most famous poem. All that bling, however, gave me another opportunity to use some of that pearlescent tinting stuff noted in Lego 22. 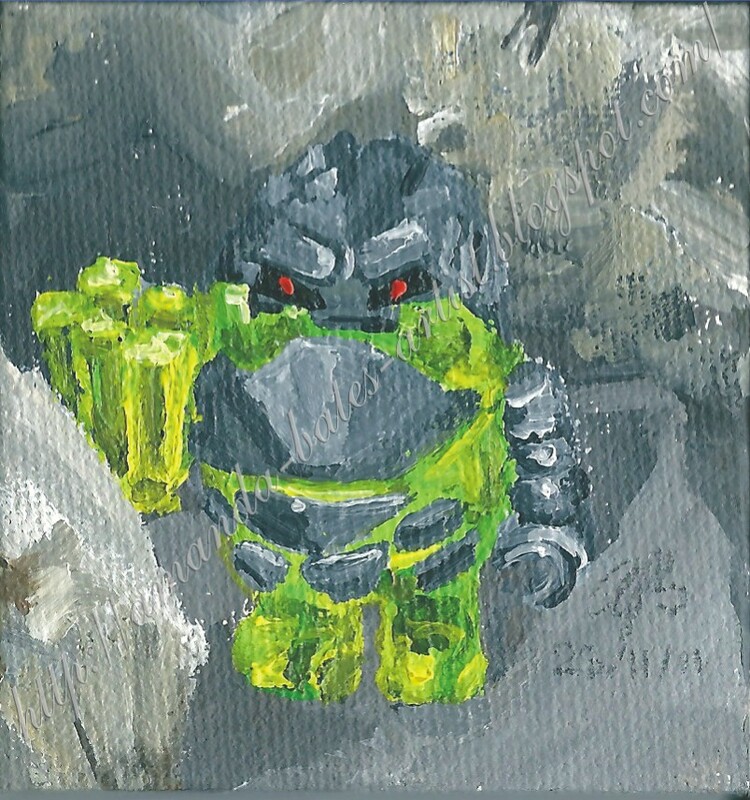 Acrylic, 7 x 7 cm. 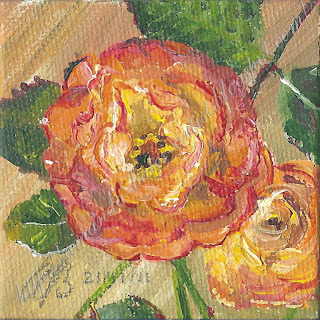 There were still a few roses growing in our garden today. There are a few less now, because I brought these two indoors to paint (I think I left two buds on the bush). They are miniature roses, coloured a very delicate orange colour and tinged with dark pink. I've got no idea what they are called, only that they must be hardy to have survived our lack of attention. 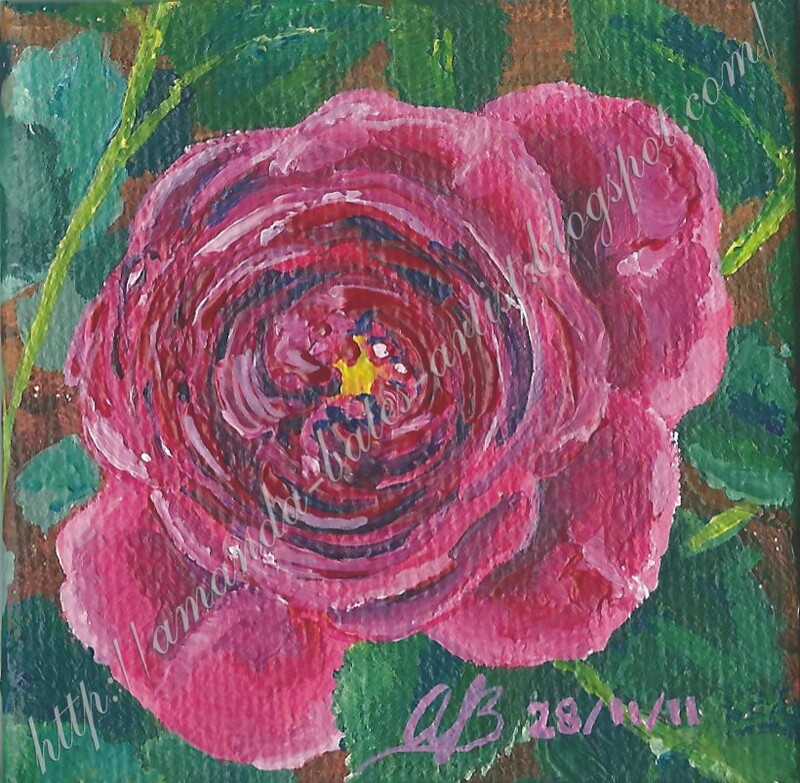 The background is an approximation to the pale wood mat that was behind the roses when I painted them. Lego Minifigures 22: "Secret Agent"
I wouldn't want to get on the wrong side of this little lady! Her red bob reminds me of the singer in Republica - remember them? It turns out that only some of Saffron's hair was coloured bright red at the time of their biggest hit, but even so. Dynamite and a golden gun? You bet she's ready to go! About that golden gun. 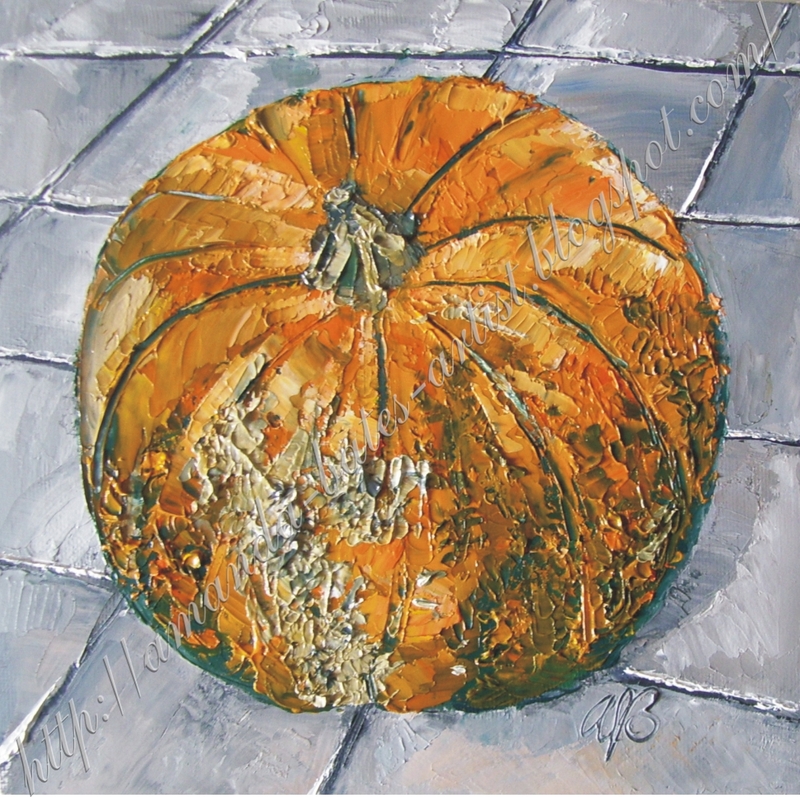 I used a bit of "Pearlescent Tinting Medium" (made by Daler-Rowney in their Cryla range; I've had it for ages, never found a use for it before) mixed with yellow ochre and a few other colours that were lying around on the palette. Highlights and reflections were required, of course, but it neatly solves the problem of how to make a metallic element stand out. 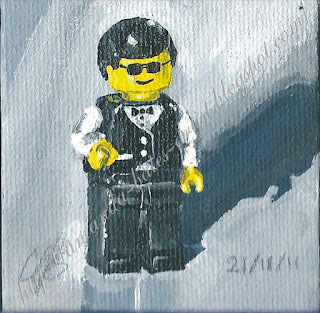 Lego Minifigures 21: "Brick Bond"
"The name's Bond... Brick Bond." Amazingly, the sun came out while I was painting this, allowing for an exceptionally sharp afternoon shadow on the background tile - and some nice highlights on the super-cool secret Lego agent. 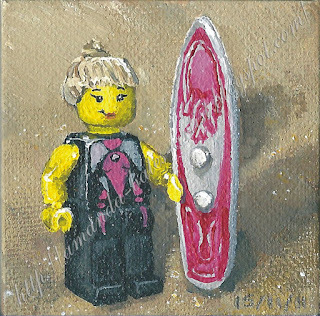 Lego Minifigures 20: "Surfer Girl Catches a Wave"
I wondered whether it would be possible to build some waves from transparent Lego, but it turns out that we don't have that much transparent Lego! So I grabbed a piece of blue paper, a few blue Lego boards, and a few transparent Lego slope bricks. It's not the most accurate rendition of the sea, but I'm sure you get the idea. 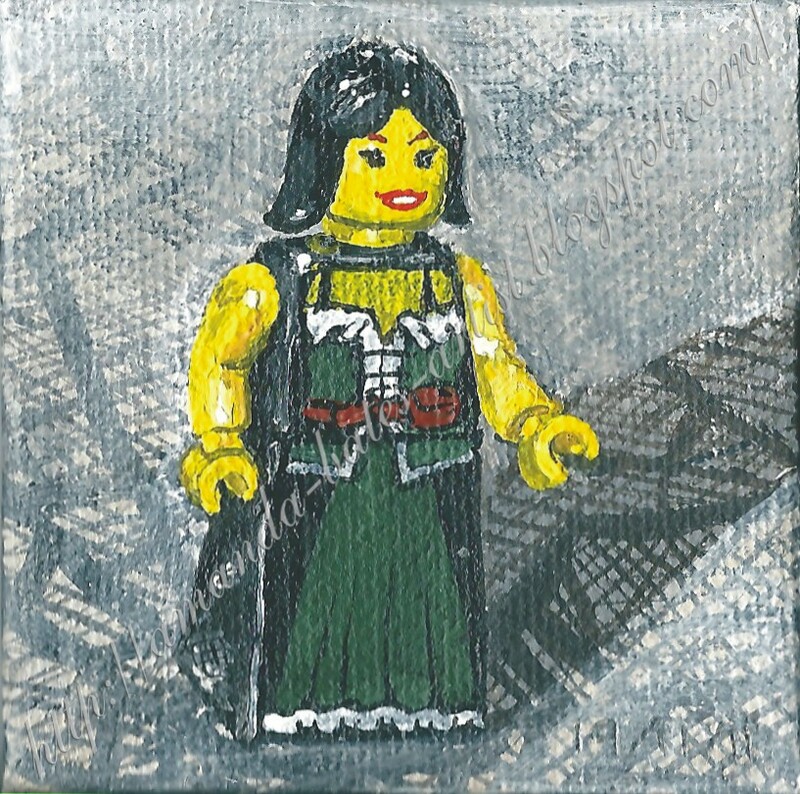 Lego Minifigures 19: "Gothic Peasant"
I think that this - the last of Bethnoir's loaners - is a peasant character from the Kingdoms series, but I also thought she looked a bit gothic, so I plonked her down on a bit of Hallowe'en netting (an offcut from the witch's skirt I made for my daughter this year). I think she looks happier there than she would have on a shiny white tile (which is underneath the netting). I'm quite excited by this. 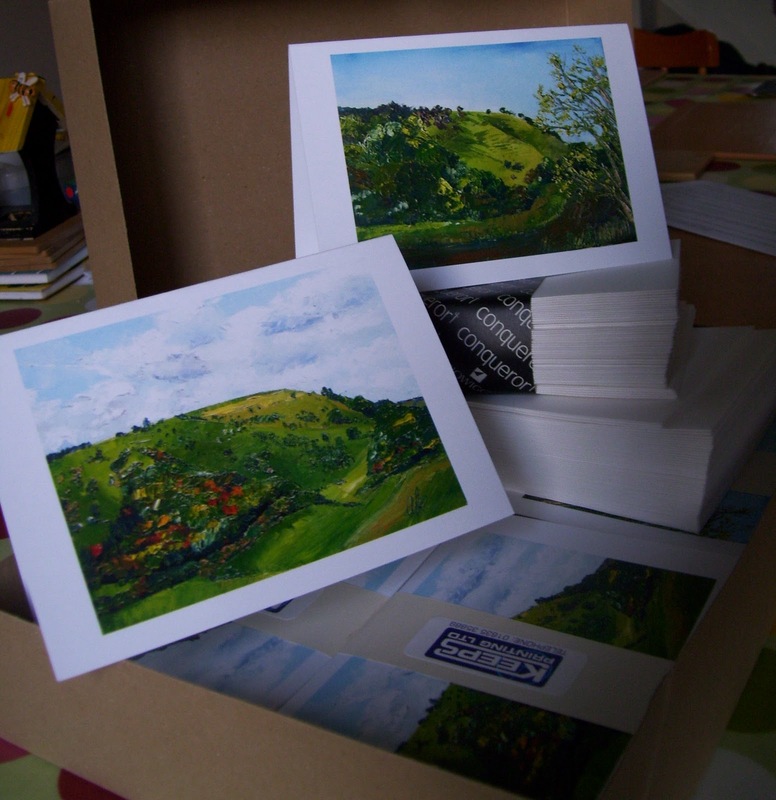 I got some cards made up by a local printing firm (Keeps Printing in Newbury - very reasonable prices and lovely service). There are 100 cards - 50 of each design. I used "Cannon Heath Down" (5) and "Watership Down" (1) - I fired up Corel Draw to arrange everything (the title, my name, and the address of this blog are all on the back) and to make a PDF that I sent a copy of to the printers. The idea is that they might sell as individual cards to people who don't feel ready to own an original painting... or who might just want to send a greeting to somebody. It'll give my stall at the school's Christmas Fair a bit more range. I might even sell something! 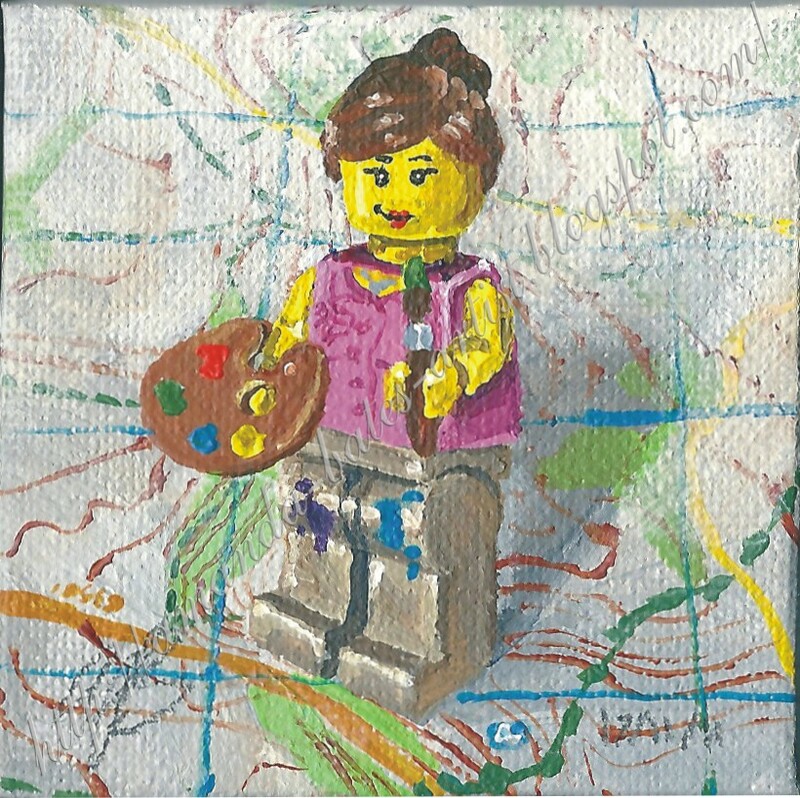 Lego Minifigures 18: "Lady Artist"
This is sort of a self portrait; with a few variations. The main one is that she's not wearing glasses. 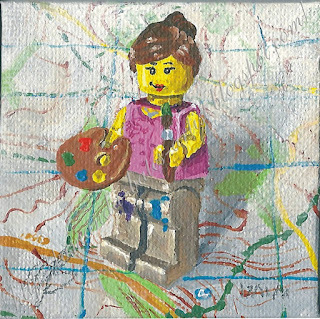 And I suppose, given where I've put her on the map, she really ought to have a painting knife rather than a brush... but I don't think you can get Lego painting knives. I haven't got a top quite like that one, either. But the paint splodges on the trousers are pretty accurate. I always seem to come down off the hill with an extra bit of green oil paint somewhere on my trousers. Any Briton of a certain age will be familiar with the Olympic winning duo of Jayne Torvill and Christoper Dean. From Nottingham, they performed brilliantly in the ice dance in 1984, and won the nation's hearts (and introduced us all to the concept of figure skating). I think that this figure looks a little like the female half of the duo. 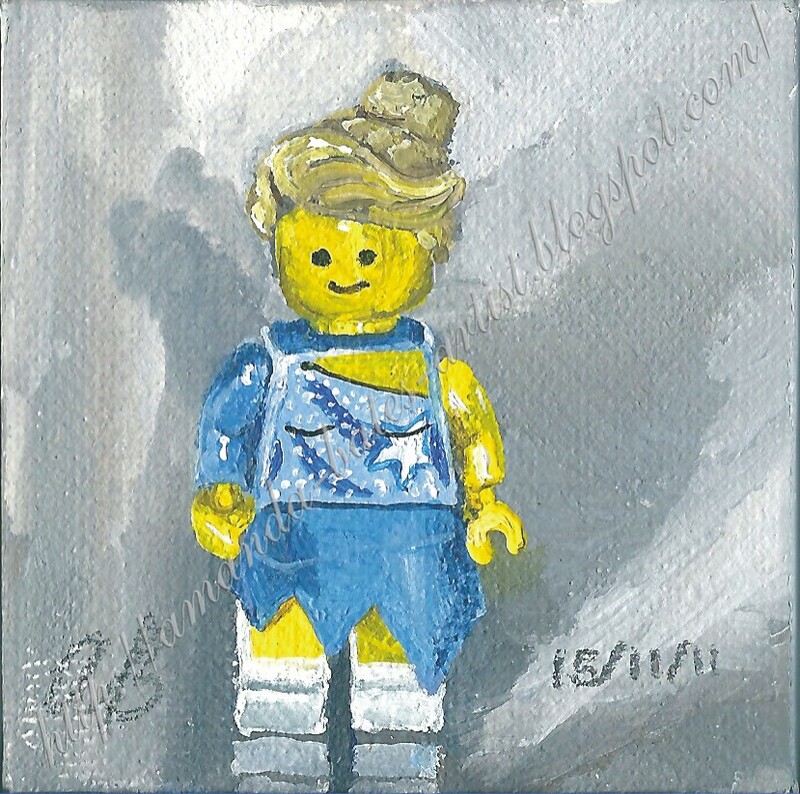 That is why I have called this painting "Torvill", instead of "Figure Skater", or "Ice Dancer". If this one were to have a subtitle, it would be "In search of Mr. Dean". I think he's got her skates, too, because she certainly hasn't! Mind you don't slip on that ice, Jayne! Acrylic on canvas, 7 x 7cm. Lego Minifigures 15: "Surfer Girl"
This cool lass is another of Bethnoir's loaners. I took the liberty of standing her on a piece of sandpaper to mimic the beach (don't worry, Beth, I carefully applied masking tape to her feet and surf board first). I had a bit of trouble mixing the colour for her hair - it's very nearly the same colour as the sand, and I had to work out how to differentiate the two objects. Another of Bethnoir's loaned minifigures; I think this must be a queen from the Kingdom range, but I have just called her the Red Queen, which brings to mind a character in Lewis Carroll's book, Through the Looking Glass. 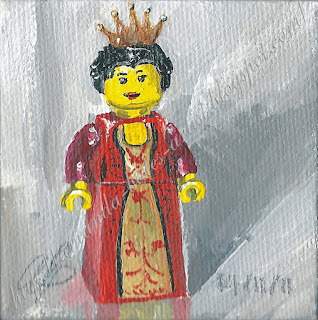 That Red Queen was a chess piece (another series I had in mind... although my chess set is quite plain), of course, and this regal lady is not. And before you go calling for their heads to be removed, remember that it was the Queen of Hearts (in Alice in Wonderland) whose catchphrase was "Off with their heads!" Lego Minifigures 13: "Dance Lady"
The lovely Bethnoir and her generous sons loaned me several female Lego figures after I noted that we were in short supply of ladies. 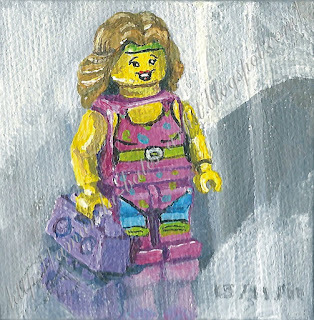 Here is the first painting of one of their figures: a very pink lady who may be a dancer, or an aerobicist, or some other sort of get-fit enthusiast. She's got a leotard, tights, headband and - very 80s - leg warmers. Not to mention her ghetto blaster. I wonder what music she's playing? Cap'n Redbeard is sailing the seven seas... well, actually, the only nautical chart that I could find was of the English Channel. That's a fairly distinctive bit of coastline; I don't think I need to give any initial letters as a clue. Do you know where he is? 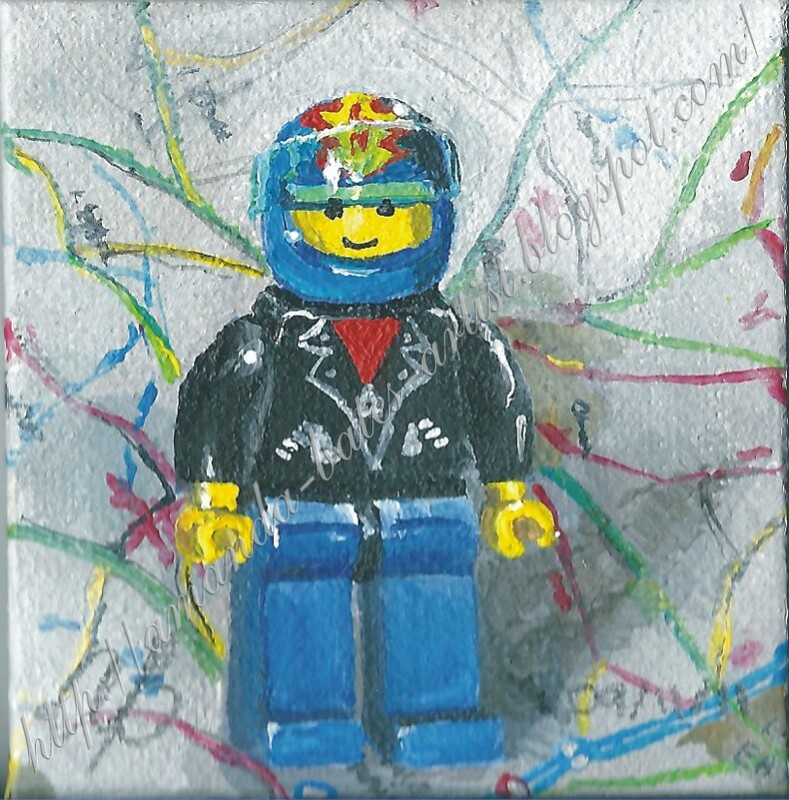 Lego Minifigures 11: "Biker - CD"
You can tell that I missed a week. Lego Minifigures 10: "Climber - K"
This little fellow's been climbing. He's got his pickaxe and his binoculars (do you think he's a "twitcher"? ), and his trusty rucksack... but where is he? The map he's standing on is a new element in this series. It is a real map - an Ordnance Survey leisure map, naturally - but can you guess the location? 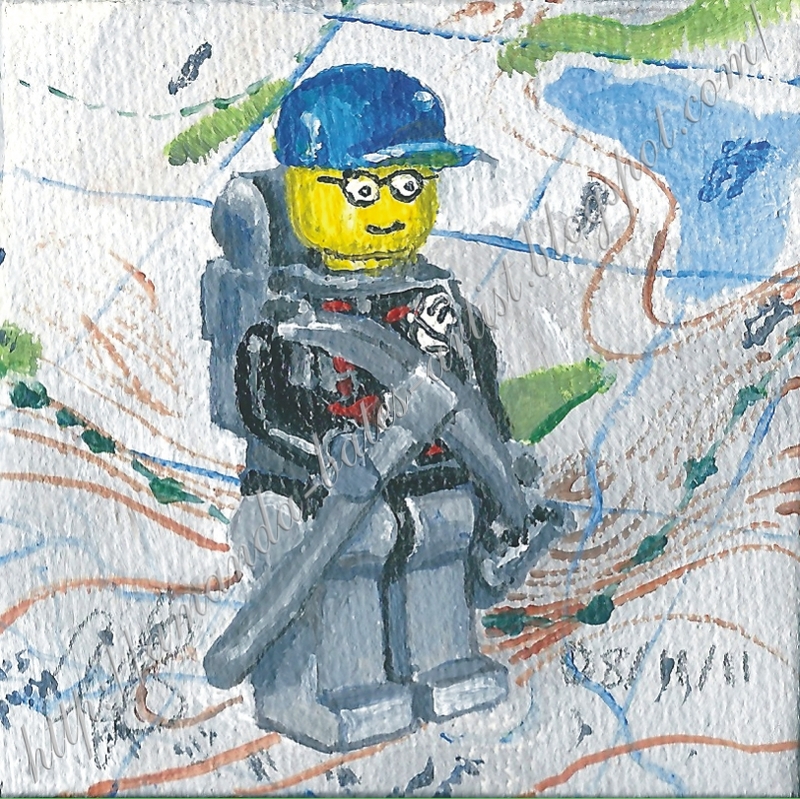 I haven't rendered the map enormously accurately - I don't think the painting requires it, and, to be honest, I wasn't using a fine enough brush*. But you might be able to guess, especially if I tell you that the "K" is a clue. And that it's in England. I'll put the answer in a comment tomorrow. 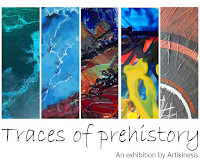 This is another old painting, as indicated by the post title. It was painted with a brush, en plein air, on a Sunday morning. Most of the work was done before the Sunday shoppers started moseying up the tow path (for such was my location). 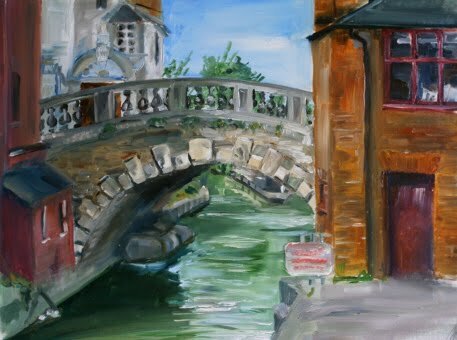 I felt slightly self-conscious, being in such a public place, but as I'd been there for long enough to establish my place - and my painting - it wasn't too bad. Most people wandered by with a passing glance, at most. Of the few who paused, all were pleasant and were careful not to distract me too much. 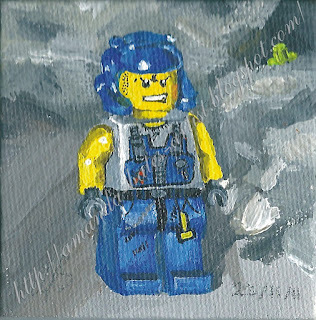 I've been painting the edges of my mini canvases (that's the 7 x 7 cm ones - the Lego Minifigure paintings and the Sweet Chestnuts). The canvases are so tiny that it seems impractical to frame them, so I thought it better to make a feature of the edges. 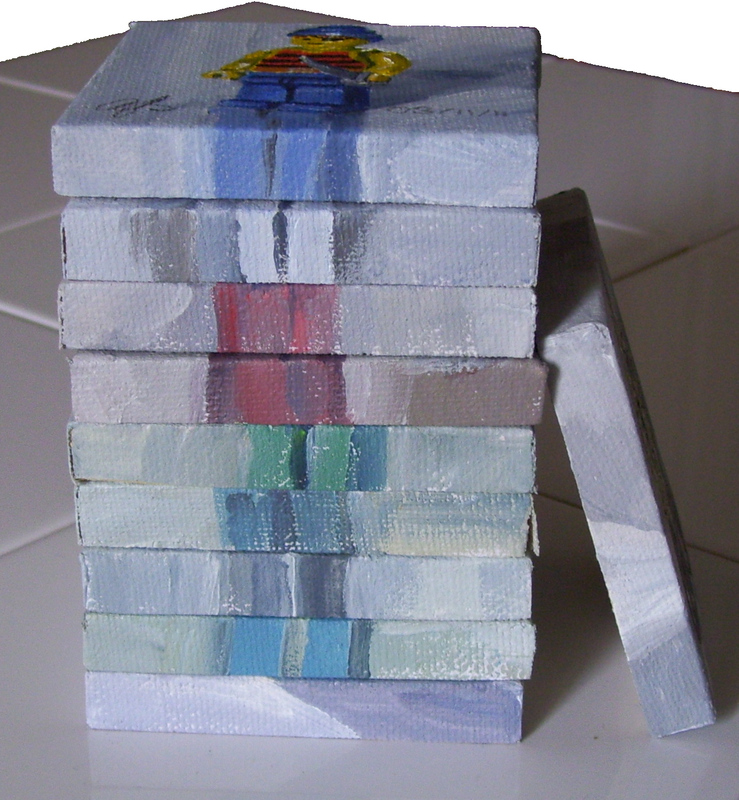 This image shows all the currently painted Lego Minifigure canvases stacked up, in order of painting. The canvas on leaning up against the side is Sweet Chestnuts. 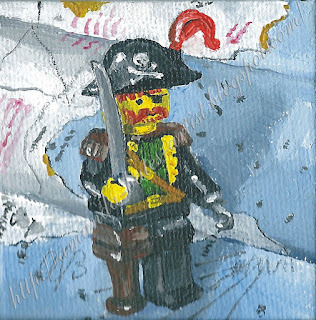 Two more swashbucklin' Lego minifigures. These two were mine (I think they came free with something or other, when I was a teenager - consequently, they never got put away with the rest of my childhood Lego). The one with white trousers came with a treasure chest, a monkey and a bit of island, among other things. The one with blue trousers came with a raft. 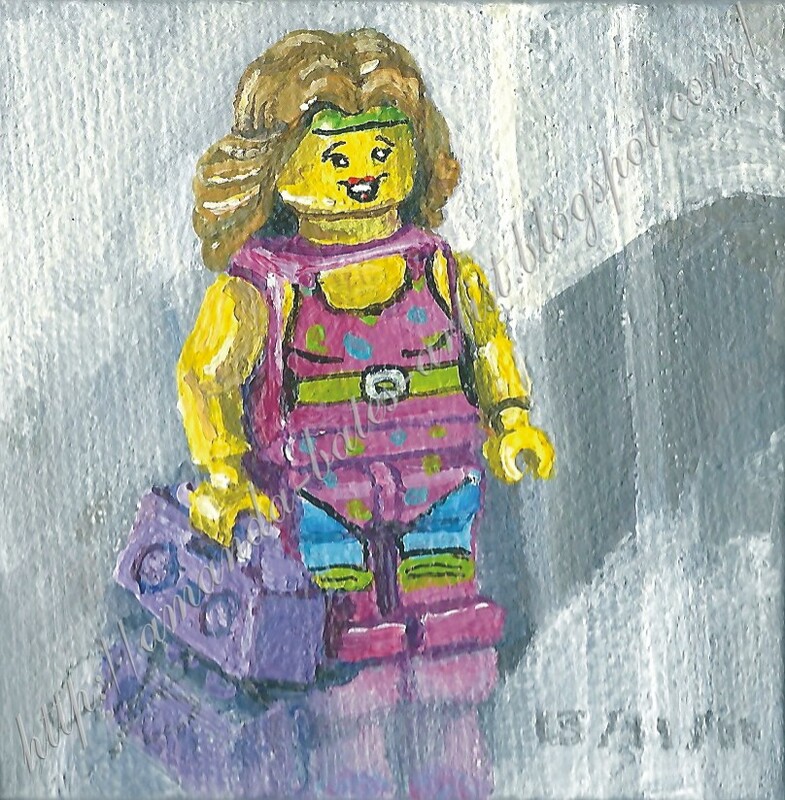 I borrowed the minifigures back from my children in order to paint them. 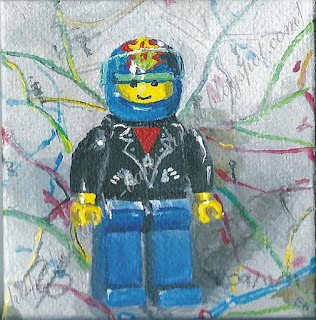 Lego Minifigures 7: "Racing Car Driver 2: The Champion"
Look! The racing car driver has won the cup! Does this mean that the Formula One season is over? 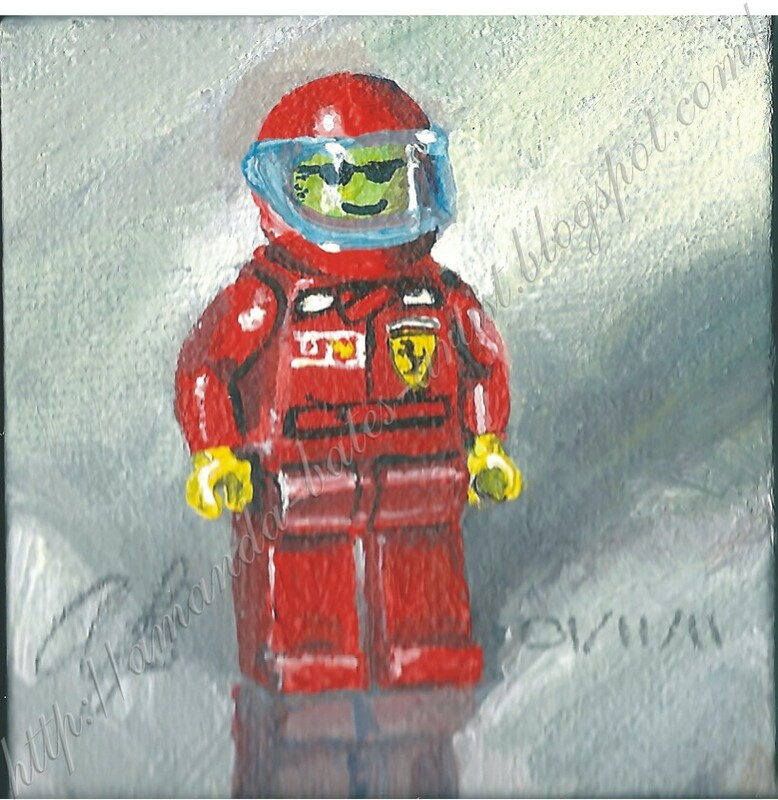 Lego Minifigures 6: "Racing Car Driver"
... and he's back, sans helmet, in the next painting. 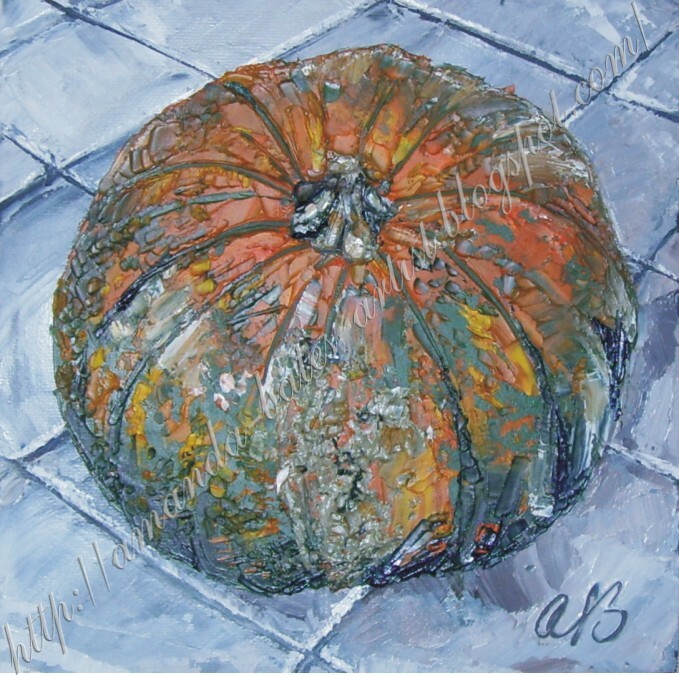 Here is the second painting of my ripening pumpkin. As you can see, this one missed Hallowe'en. It will probably end up as soup. Edited 03/11/11: The second picture - added today - is, of course, the same painting (albeit photographed under different lighting conditions), but I took advantage of the fact that oils take so long to dry to "edit" the painted highlights. Originally, they were smears of white paint. They bothered me; they were too white. 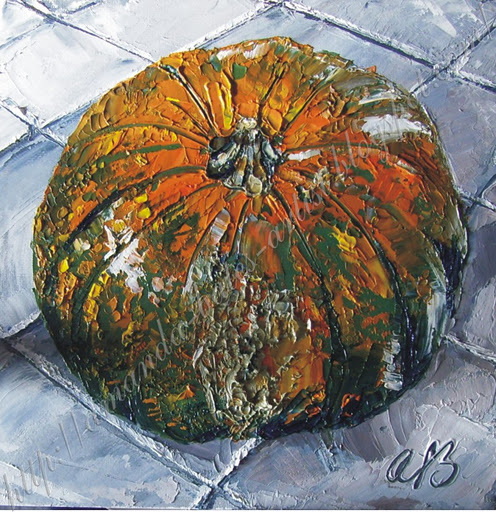 It looked like I'd dropped flour on the pumpkin, or applied my paint direct to the gourd. So I smudged them. My finger got covered in paint, but I think the result is an improvement. 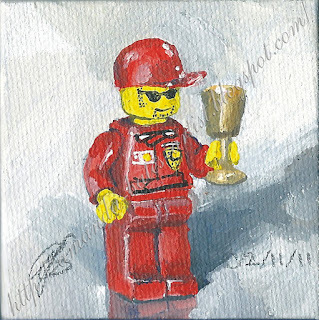 Oil on canvas, 20 x 20 cm.